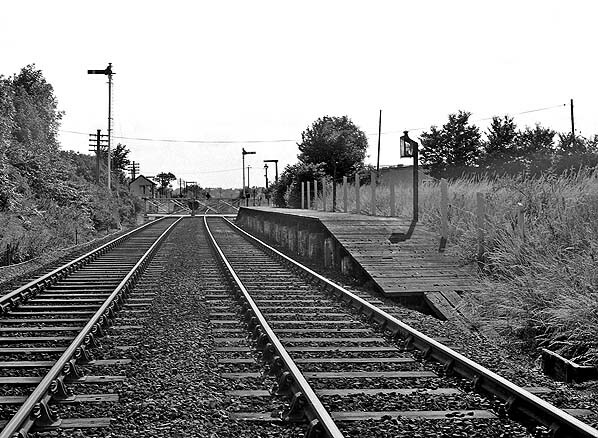 Looking south-west towards Bow Brickhill station c late 1960s. The down platform is on the right, and the up platform is on the left on the far side of the crossing. 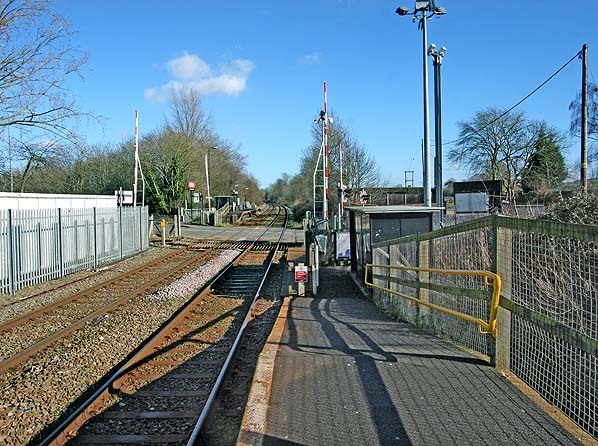 Bow Brickhill was the only one of the seven halts opened in 1905 to be provided with staggered platforms. 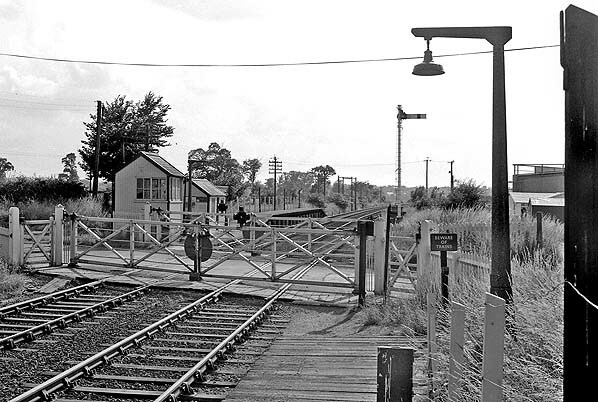 Bow Brickhill station looking south-west from the down platform c late 1960s. 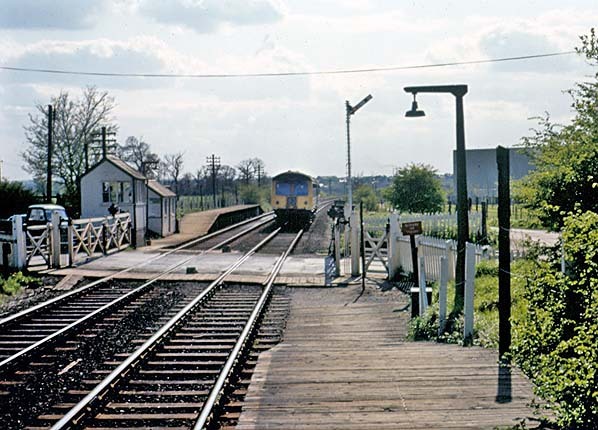 Only a short section of the original low down platform was retained; this is seen in the foreground. 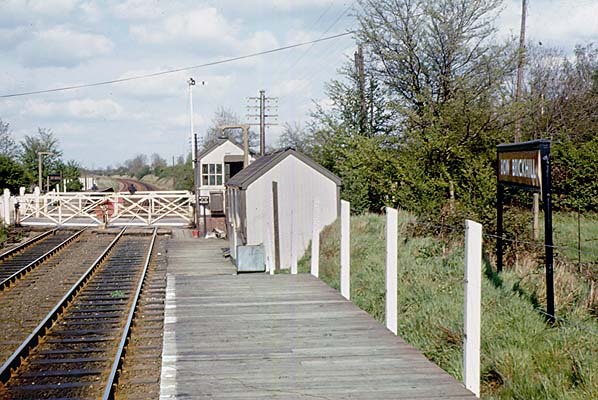 Bow Brickhill up platform in May 1973. The original track-level sleeper platform complete with waiting room and electric light remain in use. The oil lamps on the raised platform have been removed. Note the ‘Paytrain’ poster on the end wall of the waiting room; all the stations on the line have been unstaffed since 15 July 1968. 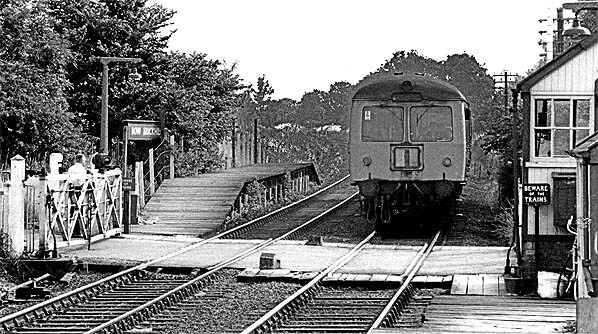 Bow Brickhill station down platform looking east from the level crossing in May 1973. 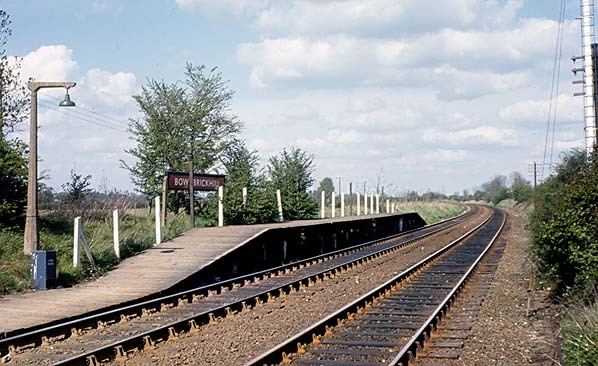 Bow Brickhill station looking east along the up platform in May 1973. The gate keeper's cottage, which was beyond the signal box on the far side of the crossing, has been demolished. 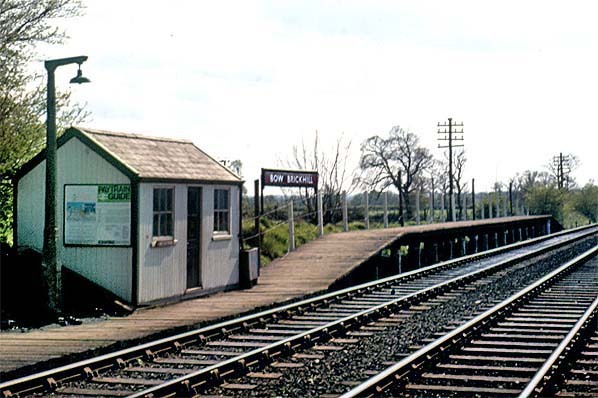 Bow Brickhill in May 1973. 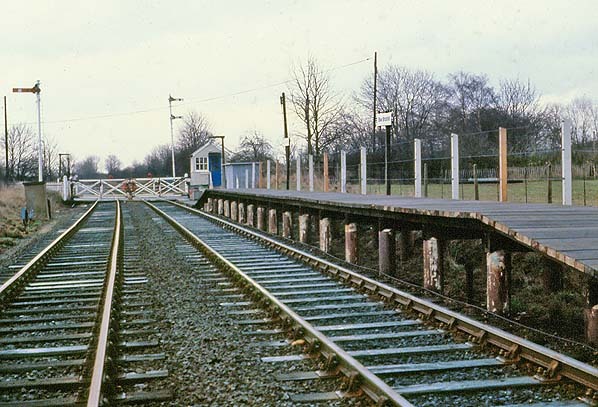 Bow Brickhill station looking east in March 1979. The BR London Midland region running-in board has been replaced with two Corporate Identity signs. The original timber waiting room has been demolished and replaced with a bus shelter. 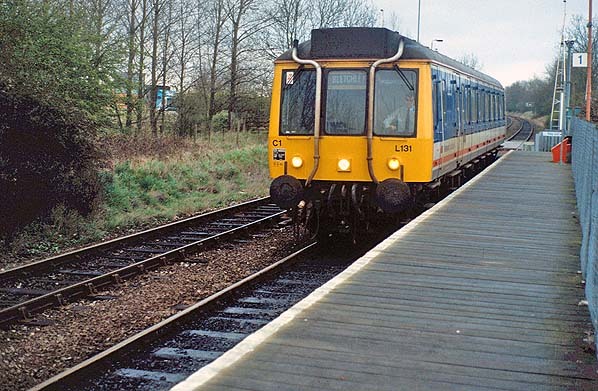 A Pressed Steel Class 121 single-unit 'Bubble car providing the 17.40 Bedford - Bletchley service is seen at Bow Brickhill station in March 1994. 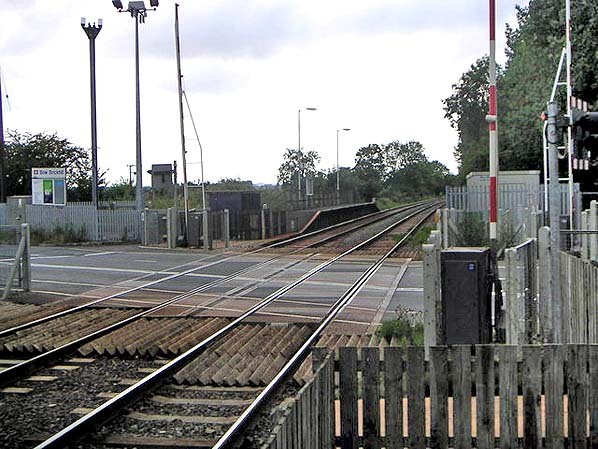 A lot has changed at this picture of the up platform at Bow Brickhill from from July 2006. 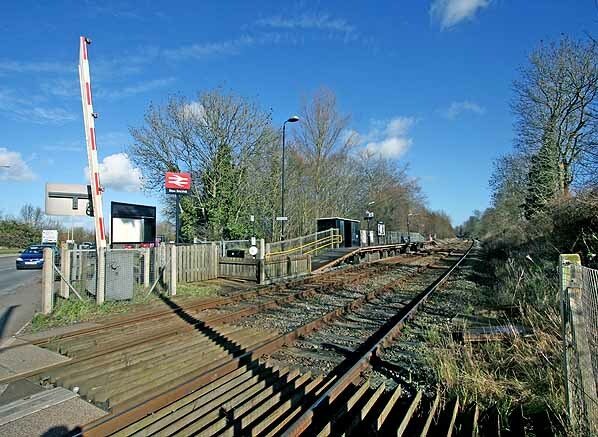 The crossing gates have been replaced with lifting barriers and the signal box has been demolished. The platform lighting has also been replaced. The line operator at this time was Silverlink. 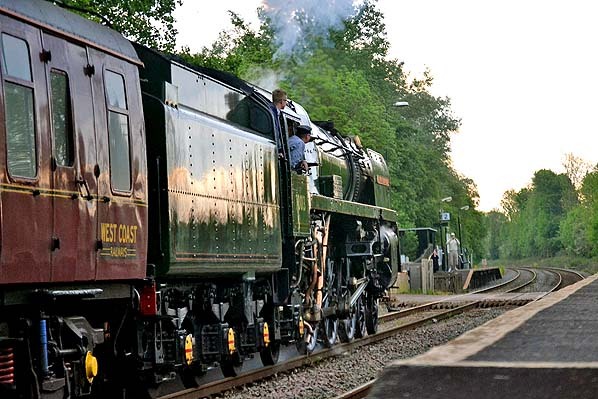 70013 'Oliver Cromwell' is seen hauling 'The Yorkshireman' steam excursion through Bow Brickhill station on 7 May 2011. This regular service runs from London Victoria to York and back and includes the Bletchley to Bedford line. 70013 is one of 55 'Britannia' class locos built at Crewe works in 1951. It is notable as one of the four steam locomotives which worked the last steam railtour on British Railways in 1968. ‘Oliver Cromwell’ became part of the National Railway Museum's National Collection immediately after the end of the Fifteen Guinea Special. In 2004, it was announced that the locomotive would be restored to main-line standard in preparation for the 40th anniversary of the end of steam. The loco was overhauled at the Great Central Railway with a view to hauling trains both on the Great Central and specials on the main line. On the weekend of 3–4 May 2008 the locomotive hauled its first revenue-earning passenger services. Bow Brickhill station looking north-east at the down platform in February 2014. 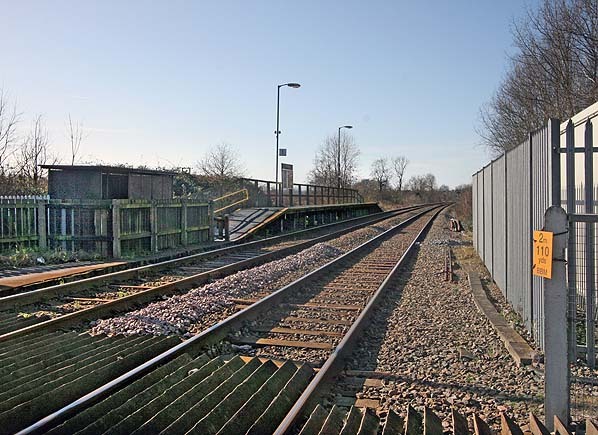 Bow Brickhill station looking south-west at the up platform in February 2014. The original low platform is still in use with the current ‘bus shelter’ on the site of the original waiting room. Bow Brickhill station looking north-east from the up platform February 2014. The original low platform is still in use with the current ‘bus shelter’ on the site of the original waiting room.